And finally, last Wednesday, members of the National Association of Home Builders (NAHB) expressed their highest level of confidence in the housing market since June 2007 – the fourth consecutive month that sentiment levels have risen. Companies that provide materials to both the building industry and buyers of existing homes- an example being The Home Depot Inc. (NYSE: HD), recent price $44.51. Builders who actually develop land, create subdivisions and construct new homes on a large scale. A pair of firms in this group would be Toll Brothers Inc. (NYSE: TOL), recent price $22.89, and Lennar Corp. (NYSE: LEN), recent price $22.06. Investment firms that own and manage properties or maintain portfolios of real estate, mortgages, or the securities of housing-related operations. Companies in this sector are generally structured as real estate investment trusts (REITs) – e.g., American Capital Agency Corp. (Nasdaq: AGNC), recent price $29.00 – or, in some cases, as master limited partnerships (MLPs) or limited liability companies (LLCs). However, the problem with all of these investment ideas – right now at least – is simple. At this point in the game, it's too late. The share prices of these companies have already moved higher in anticipation of the spring bottom. That means to a large extent, these share price moves have already happened… that's the bad news. The good news is there is still a viable way to earn a profit in this scenario if you're an options investor. Better yet, with the right options strategy you can lower your initial costs and potentially reap sharply higher returns – even while reducing your risk should the housing recovery fizzle out again. In this case, we're not talking about outright speculation or buying call options in the hope that housing stocks will rise enough prior to the option expiration to give you a profit. Instead, there are other option strategies much better suited to the current market situation. Take Home Depot, for example. Home Depot has been one of the market's strongest performers since it made a short-term bottom near $30.75 in early August. Since then, HD has gained nearly 50%, hitting a recent high of $44.55 – a level the big box store hasn't seen since April 2002. As expected, if the housing market continues to improve, Home Depot's stock should rise right along with it. But again, the risk of jumping aboard Home Depot at this level is fairly high. After all, HD traded as low as $18 a share as recently as March 2009. So, rather than investing $13,365 to buy 300 shares of HD stock (or half that if you're buying on margin), why not try what's known as a "modified option straddle." Buy three May HD call options with a strike price of $43.00, quoted early this week at $3.00 a share, or $300 for a full contract, laying out a total of $900 (plus a modest commission). Simultaneously buy three May HD put options with a strike price of $43.00, quoted early this week at $1.85 ($185 for a full contract), paying a total of $555. This combination of options gives you unlimited profit potential if HD continues to rise, strictly limits your risk if it doesn't – and can actually give you a profit if the housing recovery stalls and HD falls back. 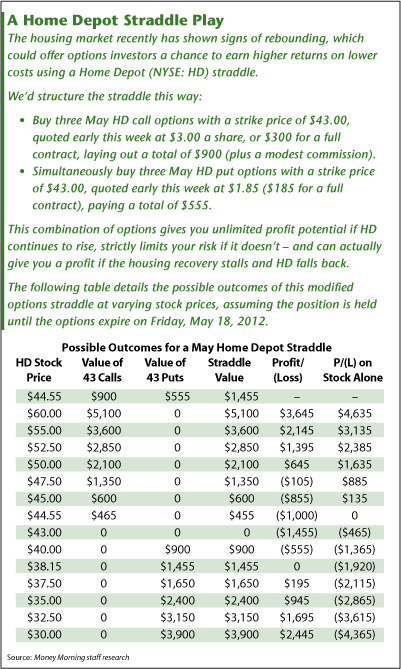 In fact, the following table details the possible outcomes of this modified options straddle at varying stock prices, assuming the position is held until the options expire on Friday, May 18, 2012. As you can see, if Home Depot continues to climb, your profit matches that on the stock alone – reduced only by the $1,455 in option premiums you initially paid. But, if HD reverses and gives back its recent gains, the profit on the put quickly exceeds the loss you would have suffered holding the stock – and actually gives you a profit should Home Depot drop below $38.15 a share. On top of that, if the trade is profitable, your returns on the straddle would far exceed those you would earn from holding the stock alone. For example, if HD went to $55 a share, your gain on 300 shares of stock would be $3,135, or a return of 23.45% on the original investment of $13,365. But, on the same move, your profit on the straddle would be $2,145 – a return of 147.42% on the much lower original cost! Plus, if you buy the stock and it moves against you, you're essentially stuck with the loss. Whereas you can actually repeat the straddle play once the May options expire, merely adjusting the strike prices to get the best risk/reward scenario at the time. Of course, if you prefer to take a longer-term options approach to the housing recovery, there's another strategy that can pay off just as well on stocks like Lennar and Toll Brothers, whose share prices are likely to increase gradually as they complete and sell more new homes. It's called a "calendar spread," and I'll detail how it works in a follow-up Money Morning article next week. 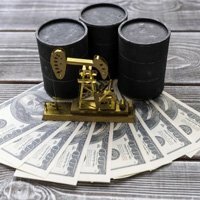 Good suggestions for an options play, however there's one thing you don't mention. I have to assume that one would be selling whatever side of the straddle is the losing portion to maximise profits and reduce losses. At least that's the way I would trade this setup, since once the direction of the underlying is indicated, why would one keep both options? The strategy outlined here assumes that volatility will increase and/or that a clearer direction will be formed. If HD ends up staying about the same, buying both puts and calls is the worst thing one can do. One could sell deep-in-the-money puts if one thinks the gains will hold mostly but might snap back a bit because of the recent rise. Otherwise, to profit on a real estate bottom, one will probably have to keep looking for something else other than what's mentioned in the article.